Men tucked this kind of drawstring tobacco bag into their belts. The fur is ringed seal, with rings or “eyes” that can be seen along the top of the bag. The light colored pieces that make up the design are seal hide that was hung outside in winter to freeze and whiten. Aron Crowell: And what kind of seal skin is that [back]? Estelle Oozevaseuk: That’s . . . neghsapigetli sangaawat [what do they call ringed seal]? Branson Tungiyan: Ring seal. (3) Samun atuuwa una [what is this used for]? Estelle Oozevaseuk: Smoking tobacco. The sewing looks like back stitches. I think that [material] is walrus stomach that has been cleaned and bleached. Uunghun [man’s sealskin bag to carry gun shells]. Estelle Oozevaseuk: This was supposed to have long [strap]. They always carry them like a purse [over shoulder, across chest]. Jacob Ahwinona: You need to have a long strap to go like this [across chest] with. Estelle Oozevaseuk: Yes, an unfinished thing. See, the top is open too, there’s no flap. 1. Museum provenience information identifies object as Iñupiaq but Elders identified it as St. Lawrence Island Yupik. 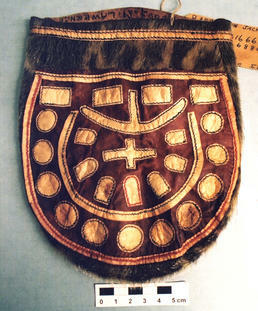 This tobacco bag was discussed along with tobacco bags E280164 and E316649. 2. According to St. Lawrence Island Yupik Elder Vera Kaneshiro, this is a qantaqusiq [man’s tobacco bag] and was sometimes worn on his belt. Men used smoking tobacco, chewing tobacco and snuff.